, fluid-filled body cavity, found in animals, which is lined by cells derived from mesoderm tissue in the embryo, and which provides for free, lubricated motion of the viscera. mesoblast, in multicellular animals (except sponges and coelenterates), including man, the middle germ layer, found between the ectoderm (the outer germ layer) and the endoderm (the inner) as a result of gastrulation. In protostomes (most invertebrates), the mesoderm is formed from teloblasts—large cells lying between the ectoderm and endoderm at the posterior end of the embryo that during gastrulation enter the primary body cavity, where they multiply and develop into two mesodermal bands. In most deuterostomes (echinoderms, brachiopods, chaetognaths, acranians, cyclostomes, fish, amphibians), the mesoderm is formed enterocoelically—that is, from separating portions of the wall of the primitive gut, or enteron. In other deuterostomes (reptiles, birds, and mammals), because of secondary changes in the process of germlayer individuation, the mesodermal rudiment becomes part of the primitive ectodermal layer during the blastula stage and later becomes a third germ layer, the mesoderm. In flatworms and nemertines, the mesodermal bands give rise to the connective tissue that fills the spaces between the viscera. In annelids and arthropods, they divide into paired somites with a secondary body cavity, or coelom (see Figure 1). The longitudinal muscles of the body and the excretory organs develop from the walls of the coelom. The mesoderm develops more or less similarly in the various groups of vertebrates (see Figure 2). The rudimentary notochord develops in the dorsal part of the embryo. The mesoderm divides into metameric somites on both sides of the notochord. These somites are initially connected to nonsegmented ventral portions of the mesoderm, called lateral plates (splanchnotomes), by narrow segmented stalks, or nephrotomes. The wall of each somite then differentiates into sclerotomes, dermatomes, and myotomes. The sclerotomes form the axial skeleton and connective tissue; the dermatomes, the connective-tissue layer of the skin; and the myotomes, the skeletal musculature. The nephrotomes differentiate into the renal tubules of the primitive kidney (and later, in higher vertebrates, of the secondary kidney), and the ducts of the urogenital system. The splanchnotomes divide into two layers, inner (visceral) and outer (parietal), and the coelom forms between them. The visceral layer adjoins the endoderm and gives rise to the smooth musculature of the intestine, to the blood vessels and blood cells, and to the lining of the body cavity. The parietal layer adjoins the integuments and lines the coelom. 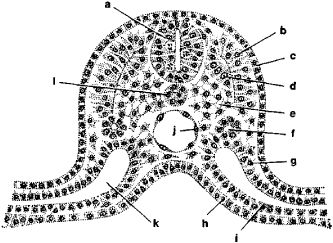 The genital ridges, rudiments of the gonads, arise in the epithelium of the splanchnotomes. The right and left lateral plates grow together over the intestine to form the mesentery. Davydov, K. N. Kurs embriologii bespozvonochnykh. Petrograd-Kiev, 1914. Ivanov, P. P. Obshchaia i sravniteVnaia embriologiia. Moscow-Leningrad, 1937. Shmal’gauzen, I.I. Osnovy sravniteVnoi anatomii, 4th ed. Moscow, 1947. Shmidt, G. A. Embriologiia zhivotnykh, 2 parts. Moscow, 1951–53. Tokin, B. P. Obshchaia embriologiia. Moscow, 1970. The third germ layer, lying between the ectoderm and endoderm; gives rise to the connective tissues, muscles, urogenital system, vascular system, and the epithelial lining of the coelom. Also known as mesoblastema. Evidence that the limb ectoderm is required for survival of the underlying mesoderm. The beginning of each treatment should be concerned with the balancing of the embryonic germinal tissue layers such as the ectoderm, mesoderm, and endoderm, speaking of the colon and internal organs. The septum transversum mesoderm is known to support the growth of the liver bud (11-14). The amniotic cavity develops from epiblast and three germ layers endoderm mesoderm and ectoderm are developed from hypoblst. After closure, the neuro-ectoderm separates from the cutaneous ectoderm (dysjunction), and the space between is filled by mesoderm. In between, no fin/limb initiation takes place, because the two mesoderm layers maintain a narrower separation and, the authors propose, interact with the developing gut. In these species, mesoderm and endoderm are formed from descendants of the four vegetal blastomeres at the 8-cell stage, with the ectoderm/endoderm boundary below the third cleavage plane at the equator of the embryo (Fig. Hox genes specify vertebral types in the presomitic mesoderm. Sarcomas are malignancies derived from the mesoderm. The histopathological examination revealed that the tumor included structures derived from all 3 germ cell layers: ectoderm, mesoderm, and endoderm (eg, cartilaginous, osseous, hematopoietic, fibrous, nervous, glandular, squamous epithelial, and smooth muscle tissues). Every pharyngeal arch has a core of cartilage derived from neural crest cells, unsegmented mesoderm capable of forming skeletal muscle and bone, an artery from aortic arch and a nerve that enters it from the brain stem carrying motor fibres to supply the skeletal muscle derived from the mesoderm (4). Mesotherapy involves , according to Bodyline, painless micro-injections of small amounts of medication, vitamins and amino acids in the mesoderm - the middle layer of the skin - specific to the problem areas.